← Labour at #OxCSAE2017: The value of reference letters and should we now use FitBits to measure productivity? Time and Risk was featured prominently at this year’s conference. Amma Panin, Kewan Mertens and Emma Riley discuss a selection of papers in this area, focusing on whether present bias in the lab is real, whether incentives lead to overoptimism, whether informal risk-sharing and formal insurance are complements or substitutes and more! Are the poor really so present-biased (or just in the lab)? Rachel Cassidy (University of Oxford) asks the important question of whether behaviour that looks like present-bias in the field might actually be driven by other factors such as liquidity constraints. She answers this convincingly in Pakistan with an experiment that measures time preferences and includes exogenous variation of liquidity. There are two sources of liquidity variation – the timing of harvest and the timing of a flat experimental participation fee. Time preferences are measured by eliciting switching points in a multiple price list at two different time frames. She finds that the timing of liquidity matters. People who have access to more liquidity (whether this is through the experimental or the harvest variation) appear less present-biased. This is robust to a range of considerations including risk preferences, beliefs, and trust in the implementers. 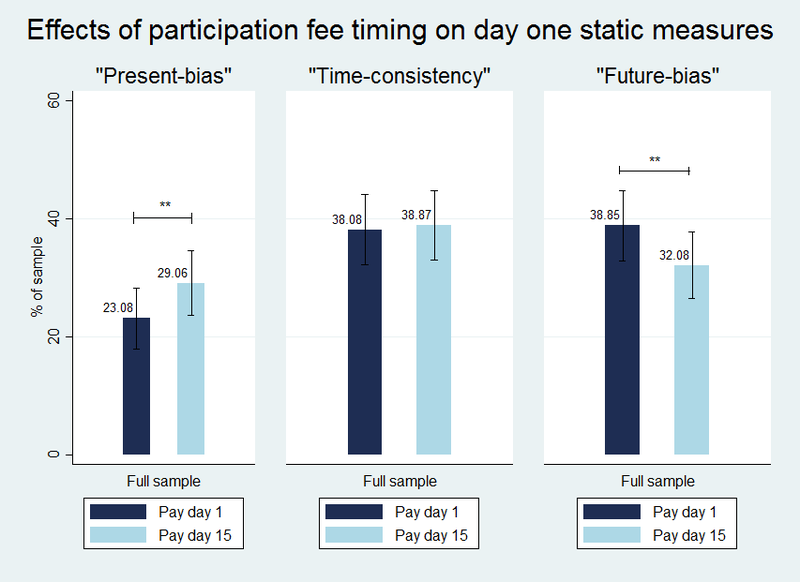 The figure below illustrates the finding for the variation in the pay day of the participation fee. Important policy implications come out of this work: are programs such as savings commitments designed to to increase welfare of present-biased people actually targeting the right participants? could optimism about future consumption streams lead to incorrect classification of present bias? This presentation can be watched live on our video feed page. David Kunst (Vrije Universiteit Amsterdam) presented work that tries to understand dairy farmers’ intertemporal allocations of income. The authors consider two sources of income – windfall gains from an experiment and income to the farmers from the sale of their milk. They find that while farmers overwhelmingly choose to receive windfall gains immediately, they also choose to maintain the status quo of receiving milk income at the end of the month. The histograms in the figure below demonstrate this allocation pattern. This interesting finding suggests that different sources of income might not be fungible and points to the fact that intertemporal preferences might be good- or source-of-income-specific. 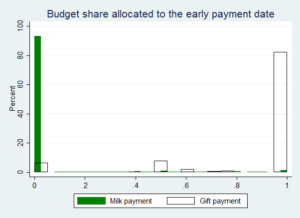 When asked, 94.85% of farmers state that they reject early payments for their milk income because they want to avoid the temptation to spend instead of saving. This raises the question of why there is concern to save particular sources of income instead of others. 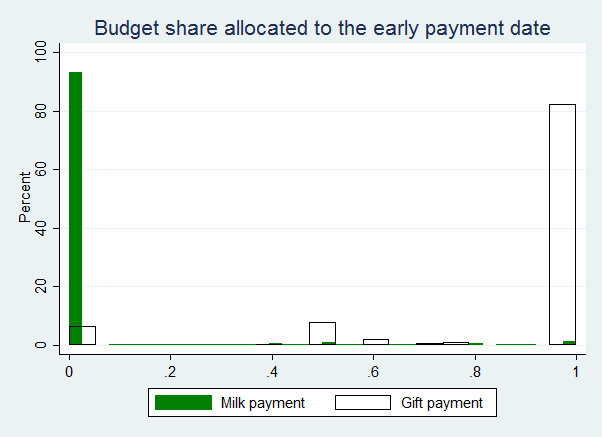 The authors suggest that this could be driven by the regular nature of the milk payment. Regularity might make savings more attractive because of mental accounting, a desire to prevent capture of known income, or reference dependent time preferences. These are all interesting channels for further exploration. Micro-credit institutions in Bolivia frequently impose strong monetary incentives for on-time repayments of loans. 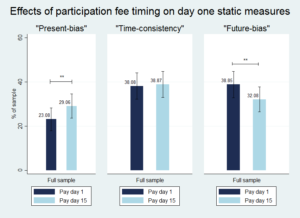 With a lab-in-the-field experiment Francesco Cecchi (University of Groningen) investigates whether monetary incentives (“speed-incentives”) can lead to over-optimism, thereby potentially reducing, rather than increasing, the on-time repayment of loans. Their study suggests that we should take into account how incentives alter beliefs, when designing interventions. Anchoring effects might provide an alternative explanation. Farmers that are more exposed to landslide risk in Uganda seem to have a lower intention to plant trees. With a cross-sectional survey and detailed plot mapping Kewan Mertens (KU Leuven) shows that this trend only holds for farmers that have a low self-efficacy with regard to planting trees. Several explanations are put forward and tested. The study rules out a lack of awareness among exposed farmers. Could fatalism perhaps provide an alternative explanation? Formal insurance and informal risk-sharing: substitutes or complements? Is formal insurance a substitute for or a complement of informal risk-sharing? Michael Blake (University of Oxford; joint work with Erlend Berg and Karlijn Morsink) presented results from an artificial field experiment looking at the complementarities of different types of insurance with traditional risk sharing in Ethiopian funeral societies (Iddirs). A drought game was played where loses were correlated, but conditional on a drought or non-drought state independent. Players had the option to purchase different types of insurance before playing the game. They found that risk sharing increased the demand for index insurance but decreased the demand for indemnity insurance. Hanna Fromell (University of Nottingham) presented results from a field experiment, where they presented villagers with vignettes on how much to share with a villager in need. This paper elicited social norms by asking people what they thought most other people would think the most appropriate behaviour in a scenario where someone in a village had some extra income but also had a friend in need of financial assistance. For women it mattered whether the extra income was private or public to others in the village for what they perceived the norm to be. This was combined with either publicly or privately paying subjects their earnings from incentivised games. Women save significantly less of their earnings when their earnings are public. More papers from the Risk and Time preferences sessions can be found in the conference programme. This entry was posted in CSAE Conference and tagged Development, OxCSAE2017, Preferences, Risk and insurance, Time. Bookmark the permalink.